Manama, Mar. 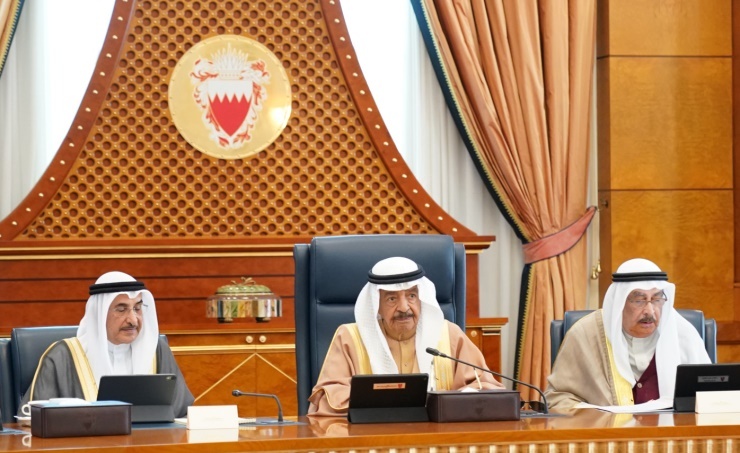 18 (BNA): His Royal Highness Prime Minister Prince Khalifa bin Salman Al Khalifa chaired the weekly Cabinet session, at the Gudabiya Palace today. HRH the Prime Minister lauded His Majesty King Hamad bin Isa Al Khalifa’s efforts to enhance the kingdom’s relations and cooperation with brotherly and friendly countries. In this regard, HRH Premier welcomed HM the King’s recent visit to sisterly United Arab Emirates, where he met the Abu Dhabi Crown Prince and Deputy Supreme Commander of the UAE Armed Forces, HH Shaikh Mohammed bin Zayed Al-Nahyan, and Member of the UAE Supreme Council and Ajman Ruler, HH Shaikh Humaid bin Rashid Al-Nuaimi. HM the King also attended the opening ceremony of the Special Olympics World Games Abu Dhabi 2019. HRH Premier also welcomed HM the King’s current visit to brotherly Turkmenistan, where he will hold talks with President Gurbanguly Berdimuhamedow. The Prime Minister affirmed that HM King Hamad’s visits to brotherly and friendly countries have consolidated the kingdom’s ties with them, bolstered bilateral cooperation and increased investment opportunities, a post-session statement by the Cabinet Secretary-General, Dr. Yasser bin Isa Al-Nasser, said. The cabinet condemned, in the strongest terms, the brutal terrorist attack on innocent worshippers in two mosques in Christchurch, New Zealand, describing it as a heinous crime and an atrocious assault that bears the hallmark of all forms of hatred, extremism and terrorism. The session extended deepest condolences to the New Zealand government and people, as well as to the families of the victims, wishing the wounded speedy recovery. The cabinet called for the need to stand united against all forms of fanaticism, extremism, hatred and terrorism, and to promote the message of love, tolerance and respect for religions. HRH the Prime Minister gave directives to study the implementation of 11 projects and services for the citizens in the housing, health, social, facilities and infrastructure fields in many regions, including Al-Makiya, Karzakan, Shahrakan, Sadad, Samaheej, Al-Dair, Jid Ali, Jurdab, Al-Kawara, Bilad Al-Qadeem, and others. HRH Premier tasked the Ministry of Housing, the Ministry of Works, Municipalities Affairs and Urban Planning, the Ministry of Health, the Ministry of Electricity and Water Affairs and the Ministry of Labour and Social Development Ministry to submit reports on the 11 projects and services ordered by him in response to the remarks made the members of the Council of Representatives, whom he received recently. HRH Premier gave instructions to ensure that the new towns and mega housing projects should include the necessary facilities and services, in addition to larger units, so that they achieve the citizens’ satisfaction and comfort, which are the government’s ultimate goal. In this regard, HRH Premier gave directives to expedite the infrastructure works at the Al-Ramli housing project, ahead of the unit-distribution process, and to give a bigger share of its units to the A’Ali, Salmabad and Buri villagers, in accordance with the criteria in force. While reviewing the preliminary results of the National Health Survey 2018, HRH the Prime Minister gave directives to the Ministry of Health to put forward effective programmes and policies to reduce the rate of premature mortality due to chronic diseases, such as heart, diabetes, cancer and respiratory diseases. The Prime Minister also instructed to intensify health awareness-raising and education campaigns on such diseases and their causes, and to take advantage of the survey and its indicators in devising future health policies and strategies. HRH Premier also gave directives to continue conducting periodic health surveys, given their importance, and to refer the results of the 2018 survey, presented by the Minister of Health, to the National Information Committee to publish them. The session approved the draft statute of the Arab Group for Space Cooperation, which aims to promote and activate joint cooperation in all space-related areas, exchange of experiences and integration of capabilities among Member States. The cabinet referred a Memorandum of Understanding (MoU) on cooperation in the field of civil space for peaceful purposes between Bahrain’s National Space Science Agency (NSSA) and the United Kingdom’s Space Agency to the Ministerial Committee for Legal and Legislative Affairs. The session approved a Memorandum of Understanding (MoU) between Bahrain’s Ministry of Health and the Prince of Songkla University in Thailand. The MoU aims to enhance cooperation between the two sides in the field of training, referral of patients and the Visiting Doctor programme. The cabinet reviewed an MoU between Bahrain’s Supreme Council for the Environment and the Saudi Wildlife Authority. Presented by the Minister of Cabinet Affairs, the MoU was referred to the Ministerial Committee for Legal and Legislative Affairs.